#4. 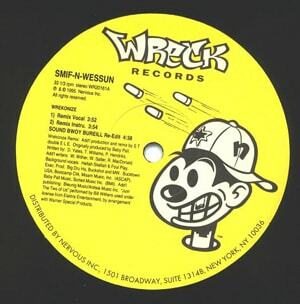 Smif-N-Wessun f/ Starang Wondah "Sound Bwoy Bureill (Re-Edit)"
Much of the early Boot Camp catalog was a work in progress, as Da Beatminerz had a tendency to continue toying with records well after the album dropped. This resulted in many cases where alternate mixes and edits would emerge as the popular choice. This re-edit (not to be confused with a separate remix) of Smif-N-Wess' dancehall-tinged soundboy beatdown tweaks the vocals ever so slightly, with the verse re-recorded and the rasta toasts slightly extended (and less virulently homophobic), but it made all the difference. Had Da Beatminerz just let the album version be, there may have been a few more soundbwoys still breathing.